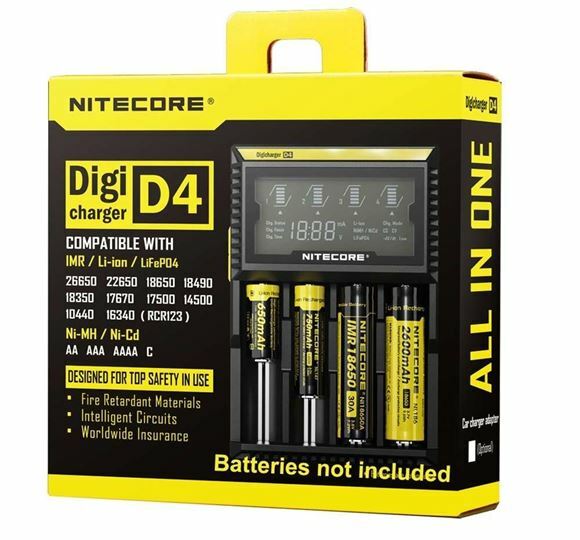 The NiteCore D4 is a universal, automatic smart-charger compatible with almost all types of rechargeable batteries thus eliminating the need to own several chargers. 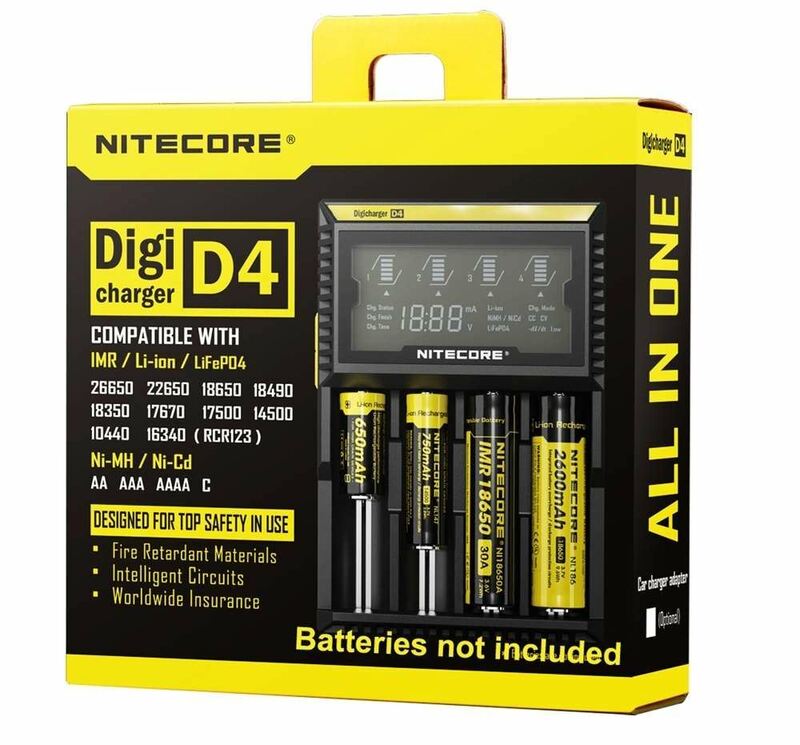 The NiteCore Sysmax D4 Digital Charger is able to automatically identify Li-ion, Ni-MH and Ni-Cd rechargeable batteries and apply an appropriate charging mode (Constant Charge Current (CC), Constant Charge Voltage (CV) and Trickle Charge). Each of the D2's two microcomputer-controlled charging bays is capable of monitoring and charging batteries independently. Additionally, yellow and blue power/charging status indicator lights visibly indicate battery status and charging process. The NiteCore Sysmax D4 Digital Charger automatically detects Li-ion, Ni-MH and Ni-Cd batteries, and through manual selection is also capable of charging LiFePO4 batteries. Intelligent charging circuitry selects the optimal charging mode (CC, CV and dV/dt) for a given battery and each of the D4’s four microcomputer-controlled charging slots then monitors and charges the battery independently. Furthermore, an integrated digital LCD screen clearly displays charging progress, voltage, current and time while an intelligent automatic power-off function terminates current when charging is complete. NiteCore Sysmax D4 Digital Charger: The world’s most advanced fully-automatic digital charger. It’s as simple as insert, detect and charge.